St. Cyril was born in Alexandria, Egypt. Cyril was born of distinguished parents, and was the nephew of Theophilus, Bishop of Alexandria. While he was still very young, he gave clear proof of his excellent understanding of the faith. After giving a deep study to letters and science he met with John, Bishop of Jerusalem, to be perfected in his Christian Faith. After his return to Alexandria, and the death of Theophilus, he was raised to that See as Bishop. In this office of Bishop of Alexandria, he kept ever before his eyes the type of Shepherd of souls described by the Apostles. St. Cyril turned with zeal for the salvation of all souls, and he took great care to keep the flock entrusted to him in purity of faith and life, and to guard them against the dangers of heresy and infidelity. In accordance to the law, he expelled from the city, those that followed paganism. 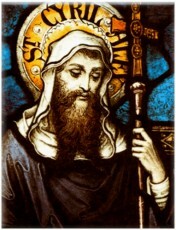 St. Cyril wrote extensively and was a leading Father of the Church, and his work is noted as “Pillar of Faith” and “Seal of the Fathers” even today. Cyril is certainly among the Church Fathers, and a Doctor of the Church. Cyril was a central figure in the “First Council of Ephesus” in 431. St. Cyril’s singular care for the preservation of the Catholic faith shone forth especially in his conflict with Bishop Nestorius of Constantinople, who declared that, “Jesus Christ had been born of the Virgin Mary as man only, and not as God, and that the divinity had been bestowed upon Him because of His merits”. Cyril in vain attempted to convert the Bishop, and then denounced him to Pope St. Celestine. Pope Celestine had Cyril preside at the Council of Ephesus, where Bishop Nestorius was deprived from his See due to his beliefs, and the Catholic doctrine as to the “Unity of Person in Christ and the divine Motherhood of the glorious Virgin Mary” was laid down amid the rejoicings of all the people. Finally, St. Cyril died a holy death, in the year of 444. He passed after having performed great labors for the Church of God in composing numerous works in the refuting of paganism and heresy, in exposition of Sacred Scripture, and in the explanation of Catholic dogmas – that founded the church you and I serve and love today. St. Cyril shows us all by his life, that we too, have to defend the truth in our times. If he had not stood up against heresy in his time, the dogma of the Blessed Virgin Mary may not be what it is today. He stood up against bishops of his time to defend the truth that Jesus was “divine” from the moment of his birth, and not something that was bestowed on Him due to His merits”. He proved the dogma that remains today, that Christ’s divinity was from the moment of His birth of the glorious Virgin Mary, and not something Christ earned over time by His merits. You and I too, can stand for the truths of our Church. The world needs the truth just as badly today, as it did in St. Cyril’s time. Ask for St. Cyril’s intercession today on his feast – to help us all defend the truth, and uphold the faith.